Translucent colors to layer and blend for endless nail art looks WHAT THEY ARE: A new line of blendable nail lacquers that let you create your own color masterpieces. This spring, the leading color experts at OPI have created a new way to get creative with nail art. The world’s number one salon brand introduces Color Paints Blendable Nail Lacquer, a line of ultra-luminous nail lacquers that let you layer and mix colors to create one-of-a-kind looks. Featuring semi-translucent, buildable lacquers, the collection invites you to let your imagination run wild. The unique silver base illuminates each subsequent layer with striking vivid color. Stripe, swoosh, or swirl on layers of eye-catching color to create your own signature style. 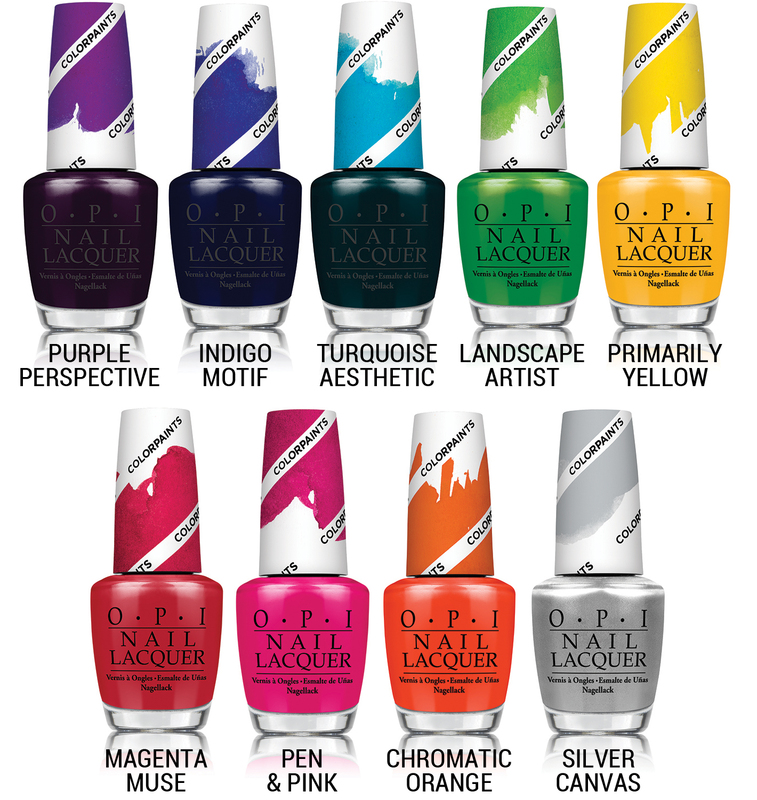 With nine new shades, OPI Color Paints Blendable Nail Lacquer makes each nail a paintable mini canvas of creativity. Silver Canvas - A clean-slate silver to illuminate your masterpiece. Primarily Yellow - Paint some sunshine with this glowing yellow. Chromatic Orange - This freshly squeezed orange is awash with color. Pen & Pink - I'm irresistibly drawn to this rosy pink. Magenta Muse - This sultry red-violet is truly inspiring. Purple Perspective - The depth of this purple is mesmerizing. Indigo Motif - I have designs on this deep, midnight blue. Turquoise Aesthetic - Beauty is in the eye of this deep aqua. Landscape Artist - The lush, verdant green of wide-open vistas. Explore these shades from May 2015 at ULTA, ULTA.com, and select professional salons for $9.50 SRP.